Have the floors under your feet seen better days? Are you tired of walking on the same floor? Try something different that complements or changes your interior design scheme. Our luxury vinyl tile flooring (LVT) is just what you need. LVT is beautiful, durable, easy to clean, and value-adding. We’ve been helping customers find the perfect high-quality flooring for years and pride ourselves on being a one-stop shop for all of your LVT flooring needs. Whether you’re planning a complete home renovation or just a small change in one room, you can’t go wrong with a luxury vinyl tile floor. If you’re not sure which type of LVT is best for your home, don’t worry. Our professional flooring experts guide you through every step of the project. The process is simple: we show you our samples and you pick what you like. Our showroom is stocked with flooring of different patterns, colors, textures, and designs. No matter your budget, tastes, style, or space, we have something for everyone. 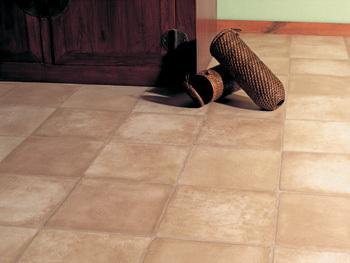 Place your new luxury vinyl tile floor in any room! It adds a beautiful decorative touch that is easy to maintain. Just sweep or mop it with a damp cloth once in a while and that’s it! You can say “goodbye” to scrubbing with sponges and spraying smelly, chemical-filled cleaners. LVT also resists water, slips, dents, scratches, scuffs, moisture, stains, and heavy impacts too. When you make this investment, it’s long-lasting and long-term! While we’re proud to offer a wide selection with endless possibilities, we don’t want you to have to sort through all of them by yourself. Our highly trained staff will be happy to help you narrow down your choices to what’s best for your budget, lifestyle, and home décor. We carry top quality name brands in all kinds of colors, materials, and textures, so you’re sure to find something you love. Our professionals put your needs first and never rush you into a decision. Whether you’re interested in choosing a design, are all set for installation, or have no clue where to start, we can help you. Once you’ve made your choice, our luxury vinyl tile flooring installation can take it from there. Choosing us to install your floor saves you time and money, because we lay floors to last. Our team of contractors is well versed in taking careful and accurate measurements, and they always clean up when they’re finished. We want to take the hassle out of home improvement by letting you sit back and just enjoy the finished product. When you choose us for installation, you’ll see the difference an expert can have. We offer a 100% satisfaction guarantee as well, which means if you don’t absolutely love your new 4-Star or 5-Star floors, we’ll install new ones free of charge. We also have some of the most impressive warranties in the flooring business, because we’re confident in what we sell and install and want you to be happy in your home. Contact us to give your home the makeover it’s been waiting for. We’re proud to serve customers throughout Worcester, Massachusetts, and the surrounding communities.